THE Commission of Inquiry into the political violence that rocked Harare on August 1 yesterday carried out inspections of various places to assess the damage. The commission -- chaired by former South African President Kgalema Motlanthe -- has been carrying out public hearings on the violence since Tuesday. "Some of the places visited include the Zanu-PF Provincial Headquarters, Herald House, the Zimbabwe Electoral Commission (ZEC) Headquarters and the National Elections Command Centre, among others. At the Zanu-PF Harare Provincial Headquarters where most of the damage occurred, the party's provincial chairperson Cde Goodwills Masimirembwa told the Commission that 18 employees survived the onslaught from MDC-Alliance supporters. "What saved the staff members is that this (the building) is a solid structure and has small open windows so they could not break in," he said. "By the time I got here after receiving a distress call from one staff member, some members of the ZNA had got here but had they not come, we could have had a tragedy." Earlier in the day, some people who were affected by the violence, urged the Government to ensure justice and compensation is provided for the victims. Mrs Elizabeth Rubinstein, whose brother Gavin Dean Charles died during the disturbances, said the people responsible for the deaths that occurred should face justice. "What happened was brutal and indescribable and the perpetrators should face justice," she said. "The soldiers who shot him should be brought to justice because anybody who shoots at unarmed people should face justice." 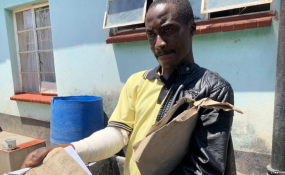 Tineyi Zhuwao, whose brother Brian was killed on the fateful day, urged the Government to provide assistance to families left behind by the deceased. MDC Youth Assembly member Mr Lovemore Chinoputsa said his party was not involved in the organisation of the demonstration that led to the death of six people. "As far as we are concerned, the MDC-Alliance had not called for a demonstration on that day but what I can speculate is that this (the demonstration) could have been a hand of a third force," he said. Mr Chinoputsa criticised the composition of the commission, saying Professors Charity Manyeruke and Lovemore Madhuku,who are among the commissioners, were not neutral. Earlier, President Motlanthe had said such criticism should have been put in writing so that they could take the matter up with the relevant authorities. The public hearings are expected to end today. Other members of the commission include British lawyer Rodney Dixon, former Commonwealth secretary-general Chief Emeka Anyouko, former Tanzania Defence Forces chief General Davis Mwamunyange and former President of the Law Society of Zimbabwe (LSZ) Mrs Vimbai Nyemba.